Machine is one of the most important discovery of mankind. With the goal of simplifying processes and making life easy, the demand for machines will only rise in the future. As man makes more machines, several industries that contribute towards manufacturing and maintenance will boom. One of them is the global magneto rheological fluids market. They are used to lubricate systems in order to ensure efficient function of the machines. Some examples include braking and clutching systems in automobiles, suspension systems, and robotics. The global magneto rheological fluids market was valued at US$ 5.1bn in 2017. Analysts have predicted that the market will climb at a phenomenal CAGR of 24.0% during the forecast period to attain an overall value of US$ 33bn by the end of 2026. Emerging areas of applications are bestowing hope among existing players, and technology is aiding new players to enter the rheological fluids market with innovative products. The global magneto rheological fluids market is segmented based on base fluid and application. The application segment is expected to hold the largest share of the magneto rheological fluids market in the coming years. In the application segment, automobiles and robotics are predicted to reign the global magneto rheological fluids market. The expanding applications of magneto rheological fluids in the automobile industry are fueling growth in the market. Earlier the product was only used for damping clutching and braking systems. In the recent years, premium car manufacturers have started using magneto rheological fluids in suspension system, opening new avenues for applications in the automobile industry. It is believed that the usage of magneto rheological fluids will trickle down to suspension systems of sedans, SUVs, and hatchbacks too. These trends will steer demand for the product in the forecast period. Another emerging area of application where players in the magneto rheological fluids market are eyeing potential is robotics. Their lubrication properties are proving to be worthy for movement of robots. As several business including logistics and manufacturing are swiftly migrating to automation, the demand for magneto rheological fluids is projected to shoot up in the coming years. Asia Pacific is a prominent region for large scale industries, thus a potential area for magneto rheological fluids. Many countries like India and China are known for their heavy industrial and manufacturing facilities that matter not for these countries, but tot the entire world. And, a large number of these internationally leading companies have moved to automation to enhance production, reduce cost, and manpower. These aspects open new avenues for demand for magneto rheological fluids in the Asia Pacific region, thus keeping it at the helm of the market during the forecast period. Other regions like North America and Europe will also remain to be prominent for the market. 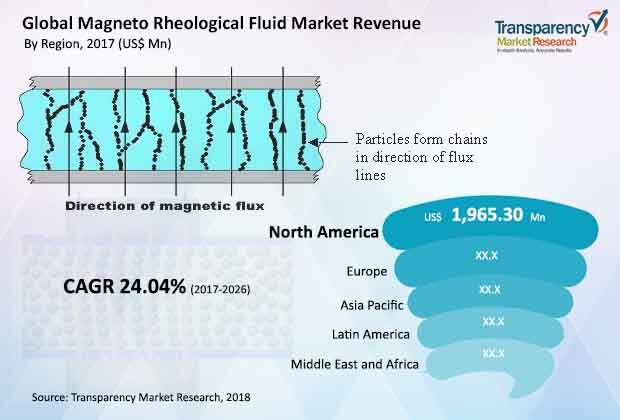 The presence of large automobile industries in the U.S. and some European countries like Germany, Italy, and France is a considerable factor of growth for the magneto rheological fluids market. Magneto rheological fluid (MR fluid or MRF) can be defined as smart and controllable fluids. It is a non-colloidal mixture of ferromagnetic particles randomly dispersed in oil or water, along with surfactants used to avoid the settling of suspended particles. MR fluid, when subjected to magnetic field, quickly increases its apparent viscosity and becomes a viscoelastic solid. Similarly, when the magnetic field is removed, the MR fluid changes back to its original liquid state. These properties are highly useful in applications such as damping and braking and clutching systems in industries such as automotive, aerospace, building & construction, military & defense, optics, and robotics. MR fluid requires state-of-the-art technology and is a capital intensive market. Therefore, just a few companies operate in the MR fluid market. However, increase in consumer awareness about the benefits of using MR fluid technology is expected to boost the usage of the fluid in the near future. Asia Pacific was the dominant consumer of MR fluids in 2017. This trend is anticipated to continue during the forecast period. Asia Pacific is estimated to be followed by North America, Europe, Latin America, and Middle East & Africa. This report analyzes and forecasts the MR fluid market at the global and regional level. The market has been forecast based on volume (liters) and revenue (US$ Mn) from 2017 to 2026. The study includes drivers and restraints of the global MR fluid market. It also covers the impact of these drivers and restraints on demand for MR fluid during the forecast period. The report also highlights the opportunities in the MR fluid market at the global and regional level. The report comprises a detailed value chain analysis, which provides a comprehensive view of the global MR fluid market. Porter’s Five Forces model for the MR fluid market has also been included to help understand the competitive landscape in the market. The study encompasses market attractiveness analysis, wherein applications are benchmarked based on their market size, growth rate, and general attractiveness. The study provides a decisive view of the global MR fluid market by segmenting it in terms of base fluid, application, and region. These segments have been analyzed based on present and future trends. Regional segmentation includes the current and forecast demand for MR fluid in North America, Europe, Asia Pacific, Latin America, and Middle East & Africa. The report also covers demand for individual segments in all the regions. The study includes profiles of major companies operating in the global MR fluid market. Just 10 companies operate in the global MR fluid market. They are Lord Corporation, Arus MR Tech, CK Materials Lab, Liquids Research Limited, Ioniqa Technologies, QED Technologies, Industrial Metal Powders (I) Pvt. Ltd., ArProDEC, Kolektor Group, and MRF Engineering LLC. Market players have been profiled in terms of attributes such as company overview, financial overview, business strategies, and recent developments. The report provides the estimated market size of MR fluid for 2017 and forecast for the next nine years. The global market size of MR fluid has been provided in terms of revenue and volume. Market numbers have been estimated based on key base fluids, applications, and regions of the MR fluid market. Market size and forecast for each major type has been provided in terms of global and regional/country markets. Porters’ Five Forces and SWOT analysis highlight the potency of buyers and suppliers to enable stakeholders to make profit-oriented business decisions and analyze the strength and weakness to gain strategic position in the market.